Sash windows are a hallmark of many historic, architectural types. Georgian, Edwardian and Victorian homes have these window designs, in various incarnations and styles. These are also a common choice for modern construction among discerning consumers who want homes with maximum aesthetic appeal and strong, lasting values. Whether you want to have new sashes installed, or need existing options maintained, draught-proofed or repaired, Mortice and Green is always the best company to call. 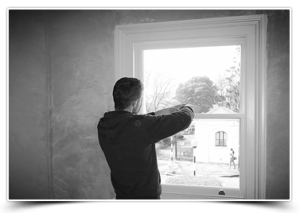 Following are several reasons why this trusted, top-rated business is the premier choice for everything relating to sash windows. It is first important to note that Mortice & Green is one of very few companies that is capable of handling every aspect of its sash window projects in-house. Some companies take on major restoration and installation projects despite a lack of sufficient experience, equipment and skills for handling them on their own. When they do this, they have to rely on outside, third-party companies to help them get the work done. This affects quality control, diminishes the integrity of warranties, elevates project costs, and limits the ability of homeowners to get truly superior results. The professionals who work at Mortice & Green are absolutely in love what they do. In fact, rather than being a general window company that consumers and businesses can turn to for all window types, this company is solely focused on the preservation, restoration, enhancement, repair and installation of sashes. Their passion for this niche is evidenced by their full-service workshop that sits just outside of London, as well as by the long-standing relationships that they’ve established with well-known and reputable, materials suppliers. From end to end, homeowners are given seamless solutions and can enjoy total transparency in pricing, firm guarantees and absolutely stunning results. When performing sash window restorations, this company is well aware of the common desire to preserve as much of the original features as possibly. That’s why existing window structures are carefully examined for signs of wood rot and other framing issues that might compromise the long-term integrity of any repairs that are performed. Each circumstance and client is given a needs-specific solution, and the work is completed in the least intrusive manner possible. Even in instances of extreme neglect and damage, original hardware and other pertinent features are saved. Sash window installation services from this company give homeowners access to all of the very best traditional and modern sash window styles. Homeowners can invest in double glazed options that provide the traditional aesthetics and natural efficiency of sashes, while offering a higher level of production and making it possible for residents to decrease their energy use even further. 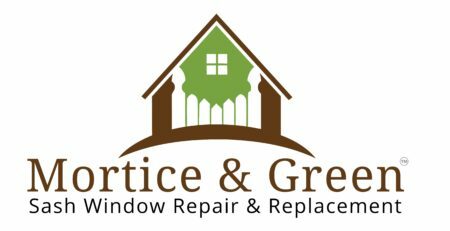 Mortice & Green also offers draught proofing and maintenance services for those who wish to protect and preserve their existing, functional windows. With draught proofing, special systems are installed to prevent cold air from seeping into the home during the winter months, and to keep conditioned air trapped within the home during the hotter months of summer. These systems are additionally capable of blocking out dust, dander, dirt, and other particulates that might otherwise diminish indoor air qualities. They are even effective for reducing outside noise in areas of high noise pollution. Having windows draught proofed will add value to these structures and to the building overall. It is also a great way to reduce the demands that are being placed on any existing, home heating and cooling equipment. Moreover, in homes that are old and historic, this additional measure can be vital for compensating for any lack of centralized HVAC equipment. Ongoing maintenance is vital for making sure that these popular property additions last. This is done by routine checking and resealing the wood frames that give these dated window designs their unique and incredibly stylish look. Having paint and finishes applied by professionals is the surest way to avoid problems with overspill and sticking. When problems do rear their heads, these professionals can show up to resolve them in a timely and affordable fashion. For instance, your sashes may have one or more broken cords that’s preventing this weighted system from functioning like it should. Problems like these are both frustrating and incredibly unsafe. In these cases, Mortice & Green can replace the damaged cord or lead weight, and can even discuss the benefits and drawbacks of upgrading to the latest cord and spring designs. 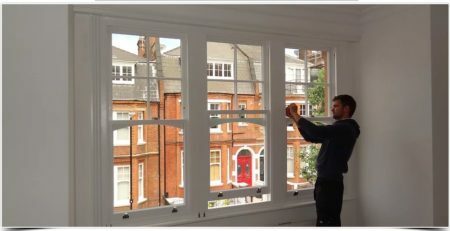 This business can additionally address issues with sticking, as well as many other common, sash window problems.